There is over 4 million square feet of office space under development in San Francisco, the largest pipeline of commercial space in over thirty years. That being said, the majority of that pipeline won’t be ready for occupancy until post-2015 and over half has already been speculatively pre-leased by companies such as Salesforce and LinkedIn. With a current office vacancy rate of 7.8 percent, down from 8.1 percent last quarter and 8.6 percent at the same time last year, the average asking rent for office space in San Francisco is currently $56.84 per square foot, up 15.4 percent year-over-year and 81 percent higher than in the first quarter of 2010, according to Cassidy Turley. And if the current trends hold, Cassidy Turley is expecting the office vacancy rate in San Francisco to approach 5 percent by the end of 2014, which should drive rents even higher. 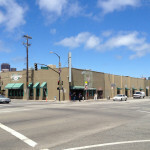 With “creative space” and access to transportation, such as Caltrain, continuing to command a premium, the most expensive area in San Francisco is currently around AT&T Park with an average asking rent of $61.38 per square foot, while the relative bargain is around Jackson Square ($50.19). 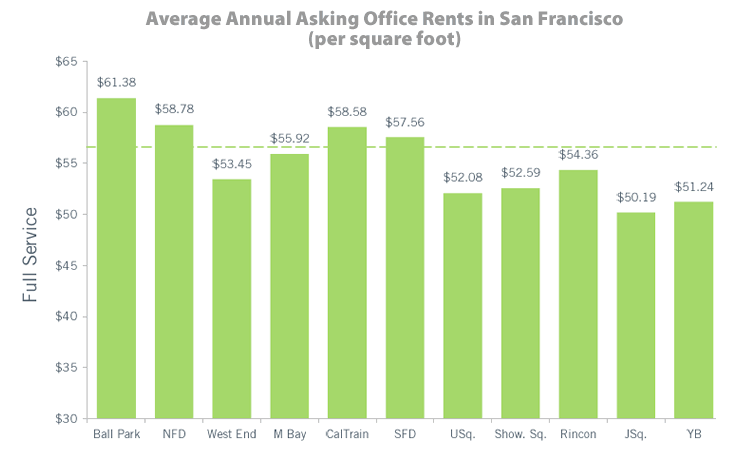 An average $60 per square foot office rent has only been observed in San Francisco once before – during the “tech boom” of 2000. And as plugged-in people know, employment in San Francisco is now higher than in the year 2000 and at an all-time high.